The RS:X came about as a result of a successful bid by NeilPryde WIndsurfing to supply one design windsurfing equipment for the 2008 Olympic Games in China. The RS:X was designed in 2004 and went into production in 2005. The RS:X design features a high technology rig, with carbon mast and boom, a ‘wide-style’ board that merges modern windsurf board design with a centreboard, thus enabling competitions to he held in virtually any condition from 3 to 30 knots. This means that the RS:X is always a dynamic, versatile class to observe, and racing is always close, exciting and visually appealing. Two sizes of sail are available for competitors. Men use a 9.5m sail while women and youth use an 8.5m sail. The sail, rig and board have been designed in conjunction with each other in order to to ensure a high level of design synergy. The RS:X Class Association was established in November 2006, and is critical to the establishment and ongoing development of the RS:X as an international Olympic Class. The RS:X is the most affordable yachting class that is eligible for competition in the Olympic Games. It is also very easy to transport, as it can be carried on commercial aircraft as excess baggage, thus allowing sailors to compete internationally at minimal expense. This allows the scheduling of many regattas which can be attended by a large number of sailors from all over the world. 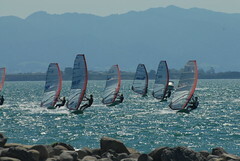 The inaugural RS:X World Championships were held at Lake Garda, Italy, and featured some 244 competitors. Subsequent World Championship Regattas in 2007 Cascais, Portugal and in 2008 Auckland, New Zealand attracted 186 and 193 sailors respectively. More than 3000 sets of equipment have been sold since production started in 2005 to competitors in more than 50 nations in 6 continents. The RS:X Class is actively involved in developing racing fleets in the U21, U19 and U17 Age Divisions who compete in separate World and Continental Championships. It should be noted that only the U19 Division is awarded World Championship titles for Youth Men and Youth Women recognised by ISAF due to the strict limitations that they impose on their number. The RS:X Class has recently launched the RS:X Reach-4-The-Top Training Programmes to assist National Sailing Federations, Athletes, Coaches and National Technical officials gain more knowledge and experience. The class is actively organising clinics and training camps worldwide. Watch some videos on the RS:X class.